Crawford Electric, Inc. of Mountain Home, Arkansas, is an electrical contracting firm that has been servicing the north central Arkansas region for more than 50 years. We have locations in Mountain Home, Harrison, and Mountain View, Arkansas. Our equipment fleet includes a boom and auger truck, bucket truck, cargo trailers, backhoes, scissor lifts, and an articulating boom lift. Our mission is to be the best provider of electrical solutions and services by working with integrity, innovation, and responsiveness. Our focus on exceeding customers’ expectations through quality installations by our well trained, professional workforce has helped us develop and maintain an excellent reputation in the Twin Lakes Area. 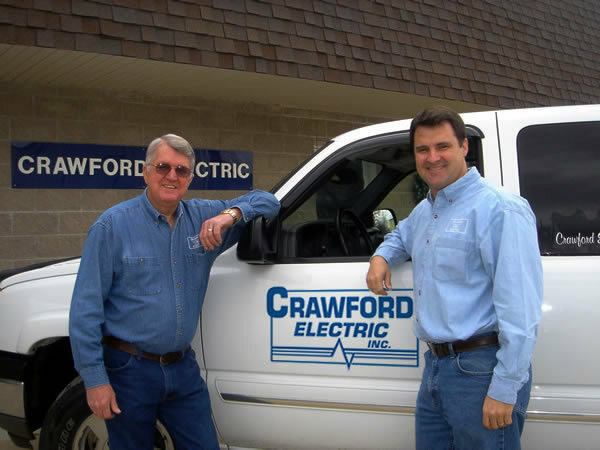 Crawford Electric was founded by Bob Crawford in 1965, and has since grown to be the largest electrical contractor in the north central Arkansas and southern Missouri area. We are electrical installers for commercial, industrial, and residential customers. We provide services for both new construction and existing markets. We dispatch skilled electricians daily through our service department for small installations or trouble-shooting problems for those in need of these services. We also sell, install and maintain power systems, or generators, and install and service solar power systems. Our focus is to provide superior services in a professional and efficient manner for our customers. We are able to accomplish this by maintaining a large and experienced staff of electricians and by maintaining updated tools and equipment. We specialize in being able to complete large or complicated projects on time and in budget. Crawford Electric takes pride in its employment of the best trained and most knowledgeable electricians in the area. We also ensure that our installations only use safe and dependable electrical products from established, reliable manufacturers. To ensure our staff is trained, equipped and prepared for years to come, the company is adament about the development of their apprentices. Crawford Electric sponsors the Mountain Home Electrical Apprenticeship School. Our apprentices attend school for a four-year program, while earning on-the-job credit during those four years. Crawford Electric is committed to providing services above and beyond our customer’s expectations. Our 24/hour answering service has assigned electricians ready to service after-hour calls if needed.